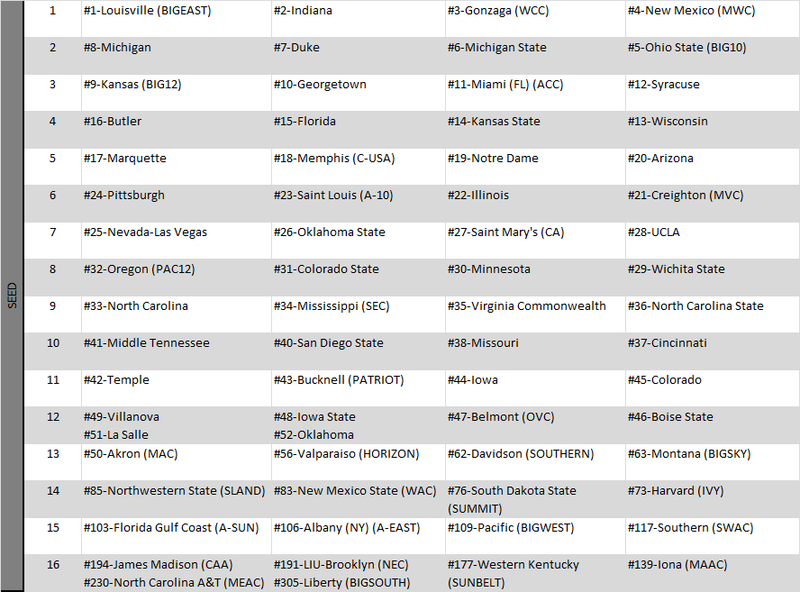 Selection Sunday 2013 is in the books. Time to release the final Achievement S-Curve of 2013 and see how it compares to the actual bracket. As I laid out in my introductory post, I am laying out my conference tournament predictions in order to compare them to other predictions out there. The two that I know of are Ken Pomery’s Log5 predictions and TeamRankings predictions. Conference tournaments got under way today with the 1st Round of the Big South and Horizon tournaments. This year I’m going to put my predictions on “paper” and compare them to some other predictions out there, notably Ken Pomeroy’s Log5 predictions and Team Rankings conference tourney predictions. If you know of any other posted predictions out there, let me know. So Charleston Southern has a 100% chance of reaching the quarterfinals (they have a bye), a 77% chance of reaching the Semifinals, 51% chance at making the final, and a 32% chance of grabbing the conference’s automatic bid. If Charleston Southern were to make the semifinals, for instance, KenPom’s prediction would receive (1 – .772)^2 “error points”, which comes out to .052. The fewer the error points, the better the predictions did. 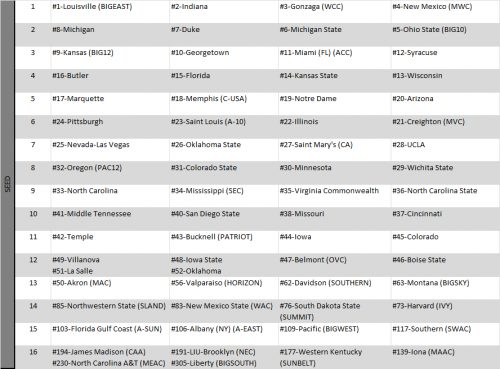 If, for instance, Longwood reaches the semis, KenPom’s ratings would suffer for their 2% prediction of that happening. That would give (1 – .020)^2, or .960 error points. In fact, Longwood did pull of the 1st Round upset and is just one game from reaching the semis. It’s finally March and I see no reason why we need to wait for Selection Sunday to fill out some brackets when we have 31 perfectly good conference tournaments to predict. Let the Madness begin. As we gear up for another NFL season kicking off in just over a week, there will be lots of discussion of Super Bowl contenders and playoff predictions. Which teams will improve and which will decline. One of the big and often over-looked factors in these exercises is a team’s strength of schedule. Often, when the schedule is released, you’ll see attempts at determining the most difficult schedules like this one that use the previous season’s records to determine the quality of the opponent for each game. While this is a reasonable starting point, it definitely has its flaws. 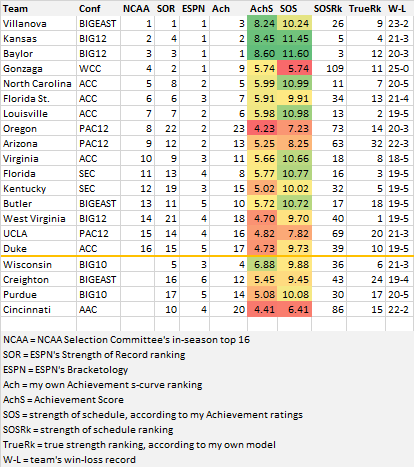 If anything else, this chart proves there are far too frequent communication breakdowns with teams across the board, enough so that the RPI goes beyond outlier status and continues to prove what many have known for years: If the RPI was introduced in 2012, it’s hard to reason that it would be adopted as conventional by the NCAA or in mainstream discussion. The RPI is a rating created to measure what a team has accomplished so far this season based on their record and their strength of schedule. It is a descriptive rating. LRMC, Massey, BPI, and Sagarin are predictive ratings at their core (though some are even worse, a random combination of descriptive and predictive). Comparing the RPI to these ratings and concluding that because it doesn’t match, it is flawed, is itself a terribly flawed argument. Of course it doesn’t match, it is trying to measure a completely different thing. I agree, the RPI is flawed, but not because of this.